Please submit any articles you wish considered for publication in our archive. All articles must be sent in electronic format and list proper credits. We will consider all articles for publication that are not just repeating what is already published here and also not merely written to promote a particular business ... the objective of this article section is to promote Sooke! Getting there by B.C. 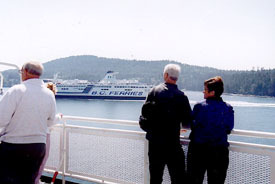 Ferries is all part of the fun. If the woman sitting beside me would look up, just once from her crossword puzzle, she would see an eleven letter word for a group of islands. A-r-c-h-i-p-e-l-a-g-o. Aboard the Spirit Of Vancouver Island, one of B.C. ferries largest vessels, I restrain myself from grabbing her puzzle book and yelling, "look--a four letter word for killer whale, O-r-c-a!" Not that I spot one mind you, but she would have surely missed it, if I had. The ferry ride from the mainland to Vancouver Island boasts precisely the kind of scenery marketing moguls thrive on--Supernatural B.C. The newest handbook guide, "British Columbia Escapes" connects you to the world outside, a getaway guide for the active and not so active traveler. And if you choose to refer to it for your getaway, you'll be that much more in touch with your destination. After disembarking, our transition from water top to blacktop converges with the West Coast Road, (highway 14) just west of Victoria, and runs 95 kms to the village of Port Renfrew. If you are inclined to trade pavement for path, at this point the West Coast trail begins for 77km, an active adventurer's route and one of the most arduous trails in North America. We settle in at The Ocean Wilderness Inn & Spa in Sooke, overlooking the Strait of Juan de Fuca 45 kms west of Victoria. 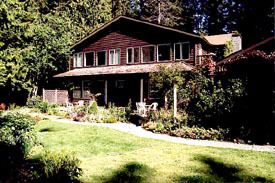 The Ocean Wilderness Inn is a retreat on five acres of old growth rain forest, with nine uniquely appointed suites, (each labeled with suitable names like the Rain Forest Room, Pacific Panorama, and Captain's Quarters.) With an outdoor hot tub located in the garden's Japanese gazebo, and trained professionals offering spa programs, I already sense the facilities will be put to good use after our intended hike. The bustling Harbourside hamlet of Sooke takes its name from the T'sou-ke native people who were the first inhabitants of the area. "T'sou-ke was the name given to a species of stickleback fish that was once quite numerous in the Sooke Basin." The community of Sooke Harbour now resides as a logging and fishing village, renowned for its salmon fishing and gateway to unspoiled stretches of beach and meandering rainforest trails. More first nation history, local artifacts, activities and accommodations can be found at the Sooke Region Museum and Visitor Information Centre. The Information Centre also doubles as the regions' weather station. Approaching the infallible Genuine Weather Stone, I read the recorded forecasts. "A dry stone means it is not raining, a wet stone means it is, a shadow under the stone means the sun is shining, if the stone is swinging--the wind is blowing, when the stone jumps up and down there is an earthquake, if the stone is white on top--it is snowing, and when the stone is wet on one side--it means that a dog has recently passed by." Our exploration begins at Point No Point where a Tearoom in a tiny cottage resides over a 400m jutting land and rock mass breaking up the pounding surf. The inviting warm rocks make for the perfect place to wait patiently for a glimpse of an Orca. With no luck, after a short stay, we continue by car to Port Renfrew and Botanical Beach Provincial Park. Within one hours driving time we roll into Port Renfrew, virtually on gas fumes. It's wise to check your gauge before setting out, because there are no gas stations until you arrive in the village. 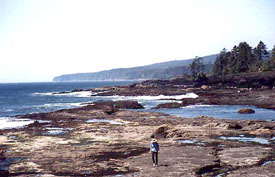 Aside from gas and a variety of services, Port Renfrew's sea faring community is the northern trailhead for the West Coast Trail. This unbroken 6 day hike with potential to stretch to 10 days has been coined, "a soul stirring tramp through some of the world's most magnificent scenery." Bliss and blisters are mutual memoirs with fellow hikers at the Port Renfrew pub, at the end of the West Coast Road--the beginning and the end of the West Coast Trail. Here, experiences are shared, serious discussions about ecology are common, and promises to lead a less stressful existence are swapped. Feeling a tad insignificant, well because--we just came for lunch. Our destination for the day is a visit to Botanical Beach to inspect the intertidal pools teeming with marine vitality. Towering Sitka Spruce, Western Hemlock, and Western Red Cedar provide a sunscreen canopy over the Shoreline trail leading down to the beach. 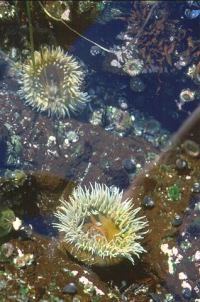 Be sure to visit at low tide, when hundreds of these unique windows of the ocean floor showoff star fish, sea urchins and anemones, just to name a few. Back at the Inn we are treated to the healing hands of massage therapist Lori Meek and esthetician Barbara MacDonald. I ask Lori what changes people experience after spending a couple days at The Ocean Wilderness Inn. She says, "it's interesting to see the difference in people when firstly, they have a massage to release all the toxins, and then secondly, have a kelp wrap the next day to absorb the nutrients. They look like totally different people than when they arrive - relaxed with a definite glow on their faces." Barbara applies a facial mask to me that is made of clay, gathered from the sandstone-like banks along the property. Barbara claims that Inn owner, Marion Rolston "has had it tested and the professionals have compared it with the formulas from the spas in Switzerland. It even has a higher percentage of minerals and all the things Europeans rave about, so we believe our findings are a good thing," she says. Observed as an entry in "The Best Places To Kiss in the Northwest," The Ocean Wilderness Inn and Spa provides eclectic offerings. A rejuvenating retreat to "replenish and restore inner energies," or simply a getaway to relax. Linda and John came from Washington State to celebrate Lynn's birthday. Ellen and Jim came from Oregon to unwind. Two lady friends came to escape their families and take a break from the kids. But yet, even more puzzling than a difficult crossword is the fact that you need a reason at all. text hidden on the page by making it the same colour as your background. excessive repetition of a word (or it's derivative) in any of your meta-tags or in your title tag or in the content of your page itself. meta-tags that do not accurately reflect the content of your site. Excite claims they are now cracking down on spam and duplicate pages. Therefore, make sure none of your pages are duplicates or near duplicates to each other even if you've placed them on multiple domains.